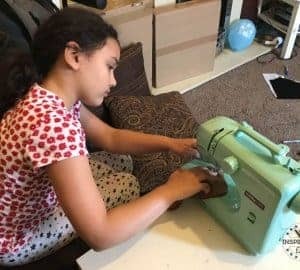 A few weeks ago we were sent the Hobbycraft Mint Midi Sewing Machine along with some basic sewing supplies from Hobby Craft. I was and still am really excited. 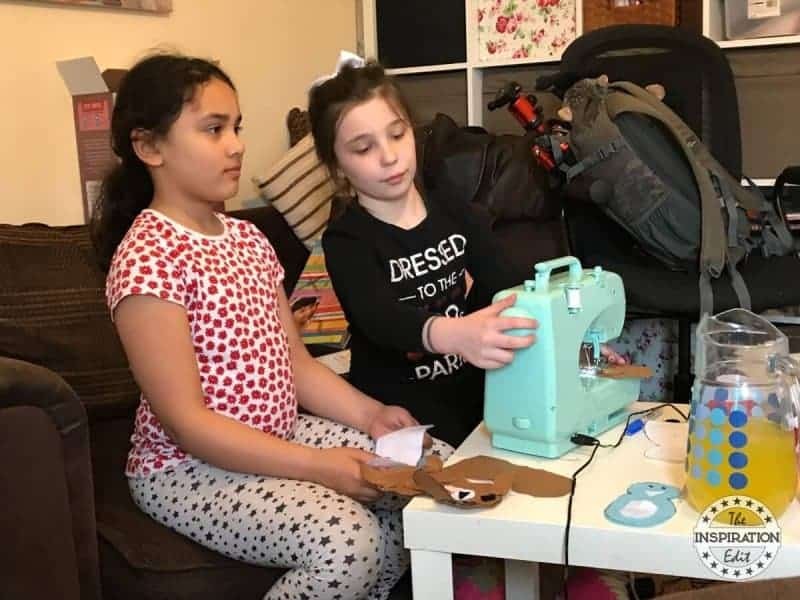 Both my daughter and I have been wanting to learn to sew and I was able to help both Sylvia and her friend learn basic sewing machine skills and sew their very first plush soft toy. 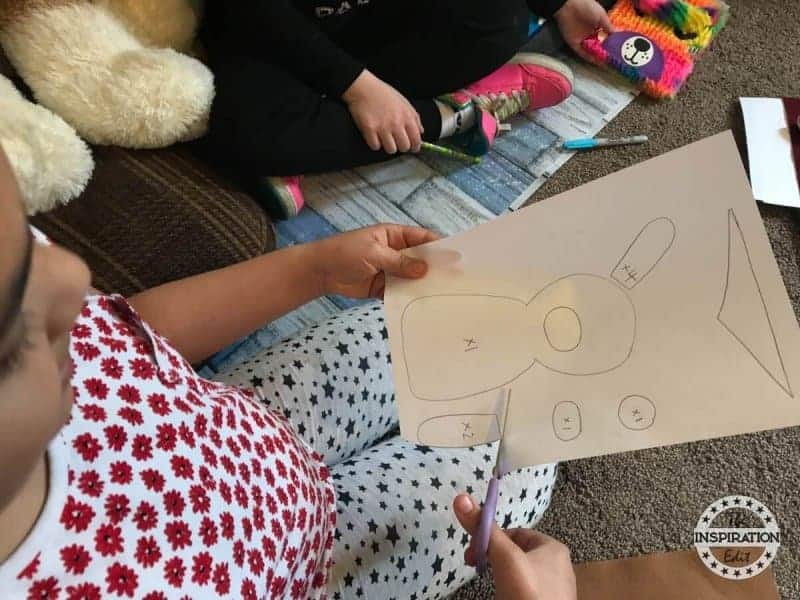 I allowed my daughter and her friend to choose the project they wanted to sew. 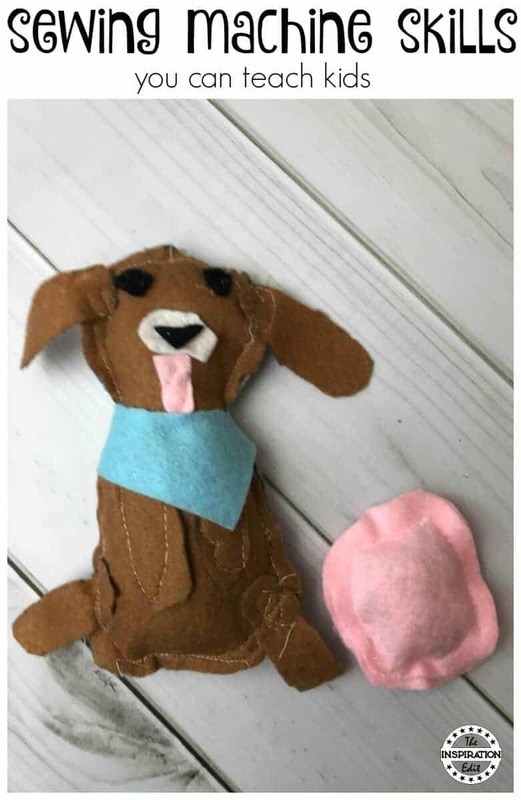 Sylvia decided to create a plush dog. She is a huge dog lover and I think the girls did amazing for their very first sewing machine project. We began by creating a template. It’s always good to plan your sewing project and either draw it out or create a template before starting. We drew our own template and this really helped us prepare the materials we needed. My daughter cut out the template and drew around this on pieces of felt. Sylvia then cut out her pieces ready to sew together with our new Hobbycraft sewing machine. After setting out the felt pieces my daughter was ready to use the sewing machine for the first time. I began by teaching my daughter and her friend how to thread the machine. They then did a practice stitching line on a piece of scrap felt. Once Sylvia and her friend were confident enough they began to sew the face of their plush dogs. 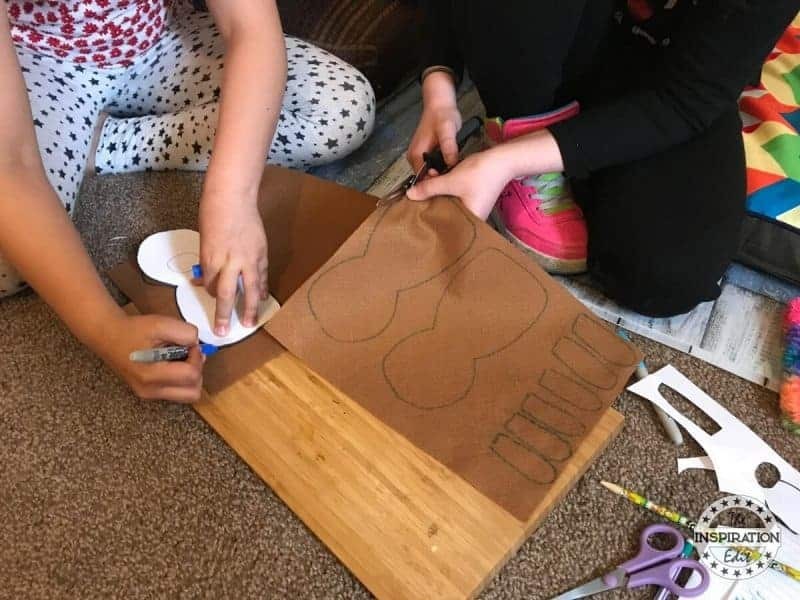 As this was their first project the sticthing was not perfectly aligned so I reassured the girls it was okay for the project to be imperfect as it was a learning process. 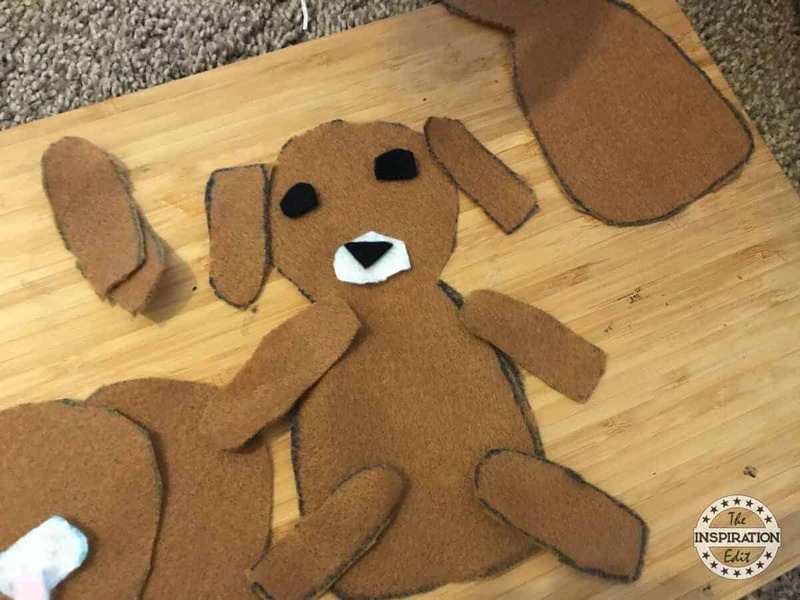 Once the dogs were almost sewn, we added scraps of felt to the insides of the dog and the girls then sewed up the final holes. They were both really pleased with their dogs. The plush dogs were super cute and a great project. I think for a first attempt of using a sewing machine as 9 years old, the girls did a fantastic job. Teach the children how to thread the cotton and prepare the needle. Do a practice run of stitching on scrap material. Reassure the kids that this is a learning process and it’s okay for the project to not be perfect. 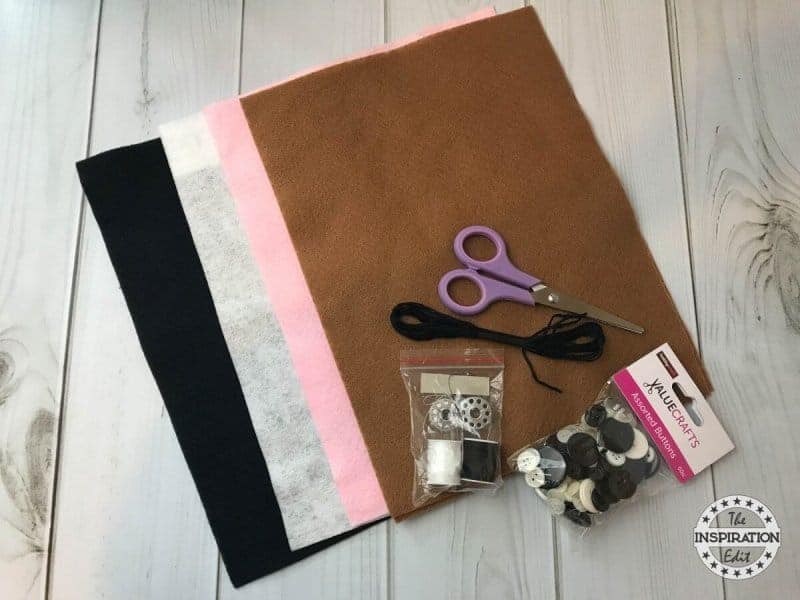 Teach the importance of making a template, following a pattern and taking time to plan the sewing project before using the machine. Make it fun. Try not to constantly tell the kids off, correct them or make them feel like they are sewing wrong. Teaching sewing should be a fun process not a chore. 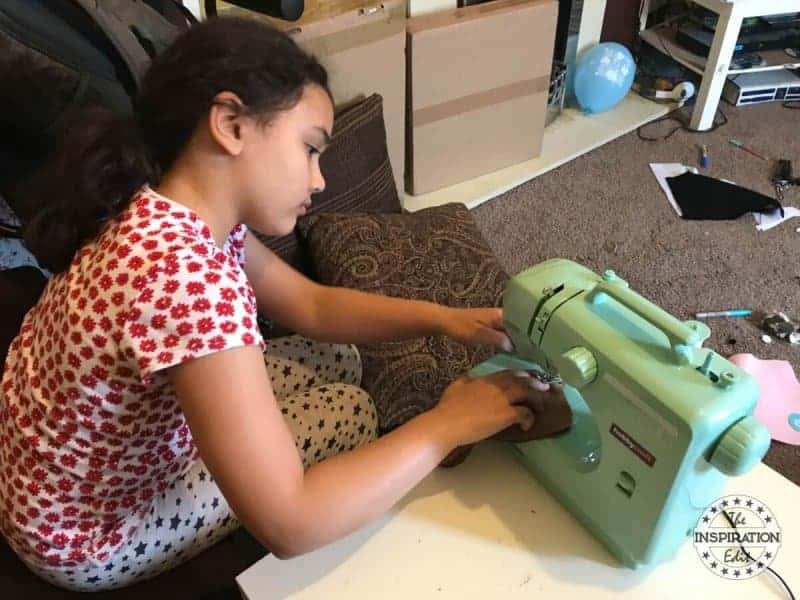 My daughter has started using my sewing machine for basic projects. She made a lot of balsam sachets around the holidays and we have done a few sewing kits as well. It’s great to start them early! Oh that sounds great. We are planning to sew felt StarWars puppets next. I can’t wait! Aww this is such a sweet idea! What a lovely skill to be able to teach our children! I absolutely love it! It is really great to teach our kids to sew and give them skills they can use in the future. 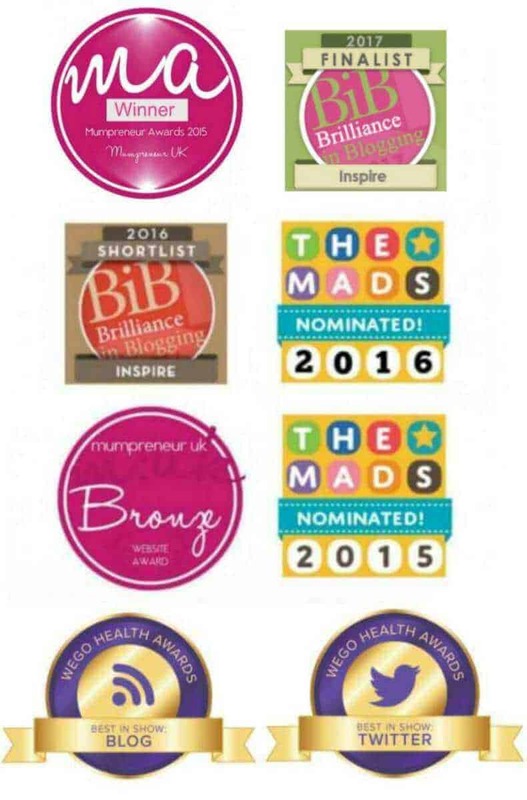 How amazing is this?! I would LOVE to teach my kiddos to do the same! It was a good first attempt. We are excited to improve from this point out! What a great fun way to bond with your kids. It is such a great skill to know for when you are older. Yes. I am hoping my daughter develops the talent as my skills are very very basic! I think some items we get can be like that. I am planning to do at least one project per month and my hubby is learning too! He wants to make a star wars cloak. Love this! Teaching my daughter how to sew. Savi g this as our nezt project. I’ll keep you posted! 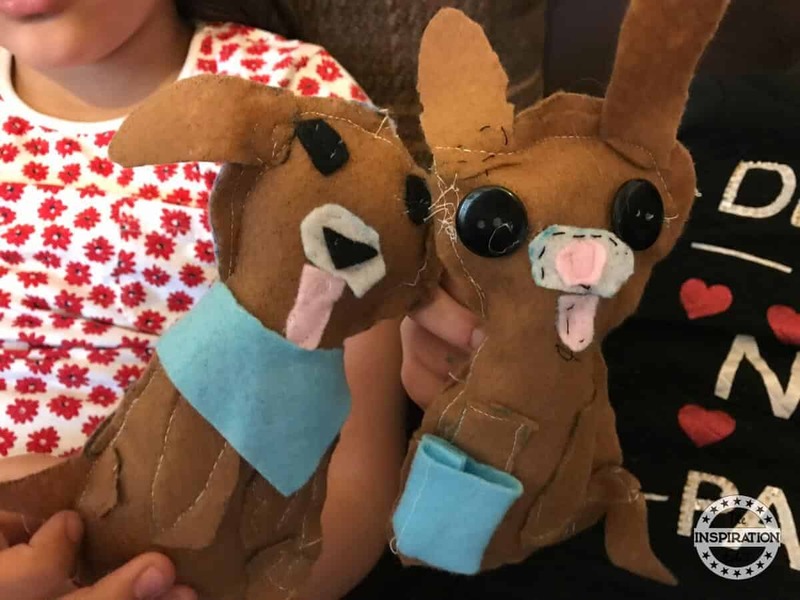 I absolutely love the idea of teaching sewing to the kids, I should rather take this project up this summer vacations and learn myself and then work up with my niece. This is a basic skill that kids need to learn. I was taught at a young age and I’m thankful because I wouldn’t need to go to an alteration store for every sewing need. Good job on teaching your kids how to sew. Yes it’s a good idea and will save money long term. I remember fondly my junior high days in Home Ec behind a sewing machine. My sister was an in elementary school sewing club and learned all different kinds of sewing/crocheting/etc. 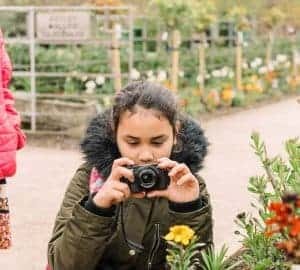 This looks like such a great activity and it encourages kids to develop a hobby outside of technology! 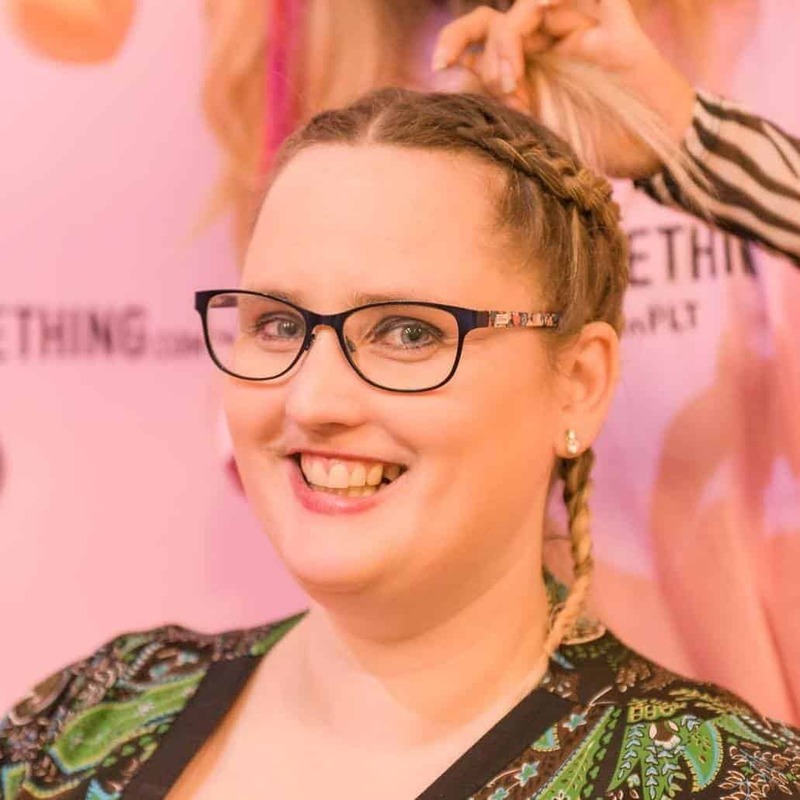 I love what you are doing! I used to beg my mom to let me use her sewing machine. She finally gave it to me when I was 30 lol! 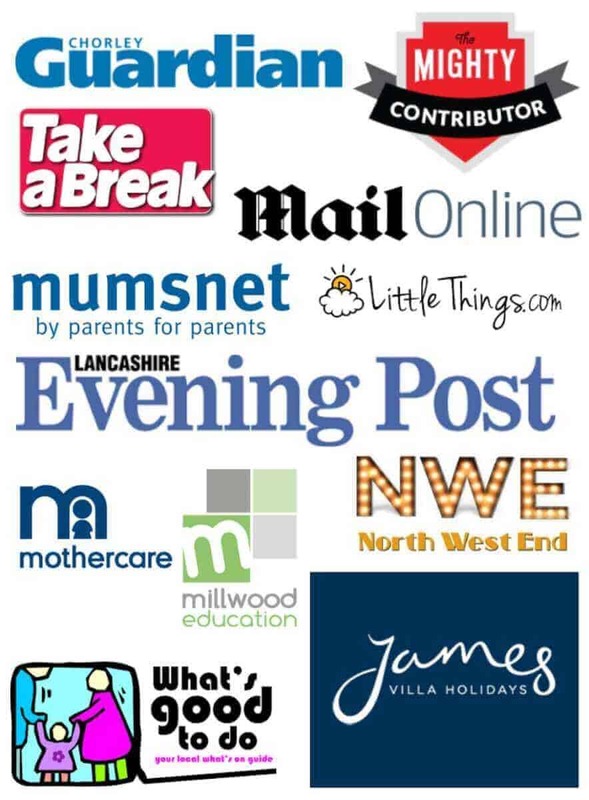 This is an excellent post about spending quality time with your kids! It’s so nice of you to teach your daughter and her friend this old and nice skill. I must admit that threading the machine can be one of the biggest problems I encountered while I was starting out with a sewing machine and it’s nice that they are getting more practice on that. Anyway, their crafts are too cute…I wish I saw the finished version of it. Yes I find threading a pain in the bum but it got easier as they practiced. 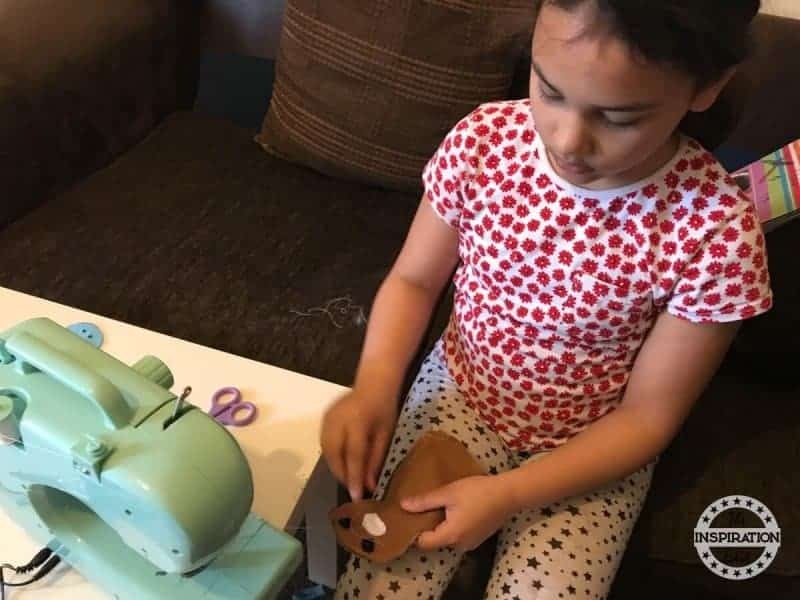 Such a nice idea to teach our kids on how to use sewing machine and have the ability of skills that can definitely use in the future. What a fun project! Was there anything about this sewing machine that made operation easier on the kids (ie did it not have a foot pedal)? I remember my son loved making the little plush creations too. The idea that he could create whatever he imagined far outweighed any hang ups he might have had with crooked stitching. It’s an adult machine and does have a pedal but it is a size small size for the girls. You must be a mind reader, as this is exactly what I have been thinking to buy. Well not for my toddler but myself, but I am pleased to know they have smaller versions for kids. It’s a great Sewing Machine and it can be used by adults too! She probably did better than her dad could have he he! The toys made are totally adorable and it’s good to see that kids of their age are doing a fab job. I am too bad at sewing and I should probably learn from these kids! Sewing is a great skill but it is hard to learn! That is so cute! It is a great way to teach them young and I wish my parents taught me when I was youbger, so I don’t have to spend money for classes. My grandmother taught me taught me to sew but I never got much practice on a machine. I wish I had learned that from her too! 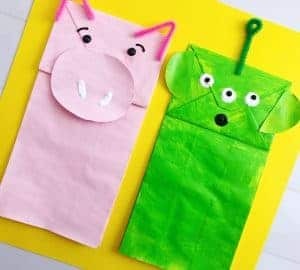 Thanks for the tips for teaching kids to sew!